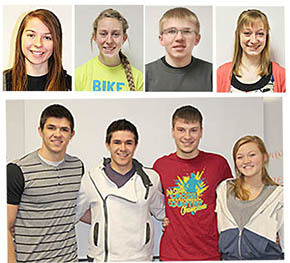 State speech qualifiers (top, l.-r.) Brianna Brugman, Sheldon Beierman, Cameron Schilousky and Olivia Groeteke, and (bottom row) Joe Brugger, Matt Brugger, Zack Nelson and Dana Grape.” title=”State speech qualifiers (top, l.-r.) Brianna Brugman, Sheldon Beierman, Cameron Schilousky and Olivia Groeteke, and (bottom row) Joe Brugger, Matt Brugger, Zack Nelson and Dana Grape.” />Eight members of the Boone Central speech team will be competing in eight events at the Class C State Speech Tournament in Kearney this Thursday, March 26. They qualified for state with their placings in the C1-4 District Speech Tournament at Norfolk Senior High last Wednesday, March 19. Details in the March 25 Albion News Print & E-Editions.